The Brothers Dal – the legendary Norwegian trio of adventurers now see their fourth feat on DVD. The Curse of the Viking Sword was originally a live show in 1997 but was shown in cinemas last year and is now out on DVD. Gaus, Roms and Brummund Dal are the main characters in a series of adventure and fantasy stories created for TV by the comedy trio KLM. Since 1979 the brothers have entertained generations of Norwegians, and the Dal adventures have become the stuff of legends. Two of the brothers, and Kristin Lavvansdatter. 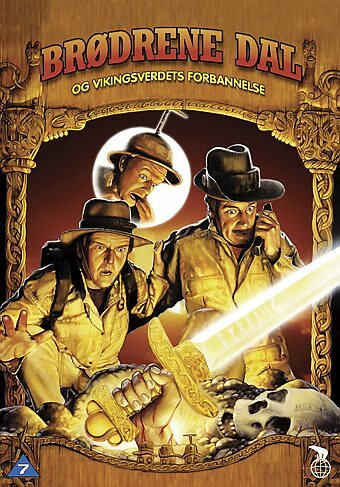 In 1997 the fourth adventure The Curse of the Viking Sword was performed live on stage at an amusement park near Oslo. The show was filmed with the intention of bringing it to TV, but as the recordings were not good enough, nothing were done about it. In 2010, the live show recording was enhanced and remastered with new technology, which resulted in a feature movie shown in cinemas. This movie was released on DVD a few days ago in Norway. The story once again starts with a time machine. The brothers are working on a time travelling device they bought from TV shop, but something goes wrong and the machine disappears with Gaus and Roms onboard, leaving Brummund behind. The machine stops in the Viking age, where Gaus and Roms are forced to solve a violent conflict between two Viking clans. Both their objectives are to own the sword Tyrfing, a magical and invincible sword that secures power and wealth to the owner. At the same time the two brothers need to find fuel to get back to their own century, with the help of the third brother, whom they communicate with via a time telephone. Directed by Wayne McKnight og Mikkel Magnus, this 92 minute comedy/fantasy/adventure is long-awaited family entertainment from the creative minds of master comedians Trond Kirkvaag, Lars Mjøen, and Knut Lystad. The DVD also offers a brand new one-hour documentary by fellow comedian Jon Niklas Rønning and the movie itself includes new digital effects and sequences compared to the live version. The region 2 anamorphic widescreen DVD comes with English subtitles.